How to Use 6.5X4 Magnets for Pushing Holiday Sales? You can pursue the age-old method of making a customer feel at ease than selling him directly. Make them feel relaxed and allow them to slip into the holiday mood before pushing your product to them. Use 6.5 x 4 magnets to wish them on holidays and stick to your brand like never before. Perhaps you might be stocking items, which sell best during holidays; you should try pushing them rather than every other available item, which doesn’t sells in the season. Give them what they love the most. Perhaps you don’t want to sound like many other cut throat marketers isn’t it? You can try to offer value added benefits such as high savings or some complementary gifts or some extended period offers, etc. Always strive to make difference by offering the things, which others do not offer. Employ 6.5 x 4 magnets to announce special benefits, referral programs, savings, etc. Being large, these customized magnets help to build influence with minimum efforts. Creating scarcity is another way of luring customer to your business and you can do it easily by using words such as “limited stock offer”, “buy, buy and buy until the stock lasts” etc. Or ask them to immediately make the purchase and save, until it is too late. This technique also works for NGOs and social organizations, wishing to donate during this season. You can add some information such as join the bandwagon or something, which triggers wantedness and asks them to join you immediately. Offering great referral bonuses or savings is one of the tested ways of building brand advocates and you can experiment it during this holiday season. You can offer special pricing benefits or other offers for asking people to join your community. Brand advocacy by referral marketing is skyrocketing like anything. You can test it for your brand, too. Else, you can make some valuable announcement such as receiving some certification or recognition. You can figure out many other ways of value building using 4×6.5 magnets for holiday gifting. 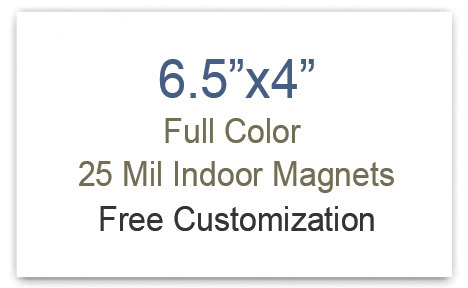 On purchasing custom magnets from any reputed online eCommerce store, you can save on art setup, online design proof, shipping, and full color printing.